The Cosy Alpine Loft has amazing views of the French Alps and is located downtown Annecy in a quiet residential neighbourhood. You will land in the city center, a short 5 min bike ride or 10 min walk from the old town and the lake. Top floor of My Sweet Home villa, the Nordic style loft has a shared garden, garage and cellar for guests bikes, skis and belongings. Bikes are available with your rental, to experience the true French Alps lifestyle - walking and biking only. Looking forward to host your family in the French Alps. The cosy Alpine loft is available for a year upon request. Possible short summer stay. Neighborhood Keywords Downtown Annecy, residential area near lake. Walking distance to the lake and old town. Short stay rental opportunities during summer mainly. Please reach out for summer rates. Annecy lover and world traveller, I started My Sweet Home project in 2016. 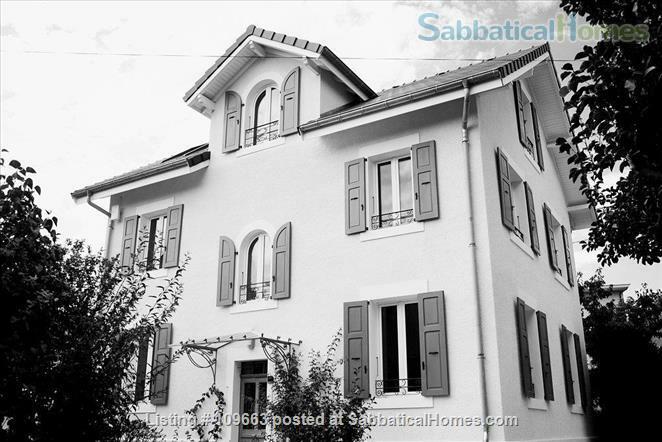 It is a newly renovated villa from the 1950s located downtown Annecy in the heart of the French Alps. My Sweet Home is a cosy landing place for the world travellers and teachers on leave. Hosted my first adventurers on sabbatical leave in the French Alps. It is always a fun & amazing experience. Looking forward to welcome you in the Venice of the Alps... Long term stay welcome. We visited for the first time the french Alps and had a wonderful stay in Annecy due to both, a great property and an incredible host family.